Renewed and relaunched in 2011, Winsor & Newton Artists' Oilbars are a unique formulation of genuine oil color in a solid stick. It offers artists an exciting and versatile way of painting and drawing — from sketching to sgraffito — and it can be used in combination with tube color. 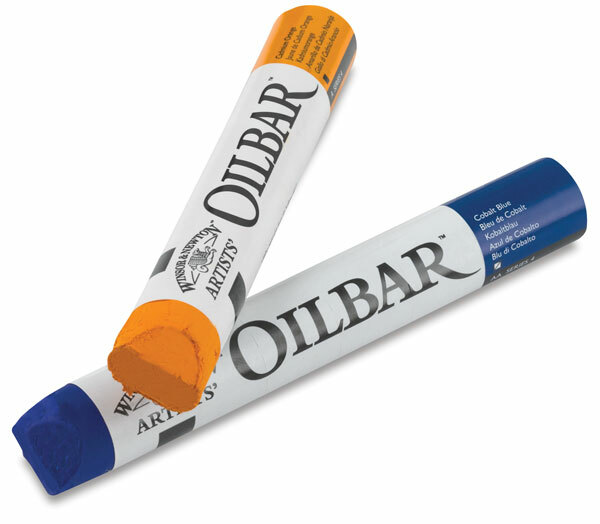 Artists' Oilbars combine the rich, buttery consistency of tube oil color with the immediacy of pastels and charcoal. These oil colors were originally developed by artists for artists and are made from quality artist-grade pigments, oils, and other specially selected waxes. A broader range of 50 colors expands creative options for artists' palettes. Better still, the new range harmonizes with all other Winsor & Newton tube color ranges for effortless transitions and combinations. Softer on application than the original, the new Oilbar transfers to canvas with less pressure, further freeing the artist to create bold gestures or subtle passages.